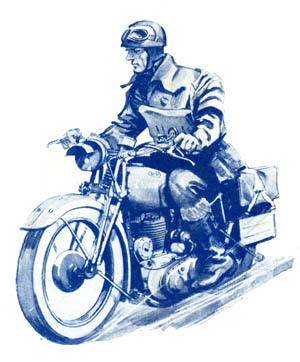 Commencing in 1939 the BSA M20 and M21 were fitted with flywheels manufactured from steel forgings. In the case of the M20 these were the same flywheel forgings as the M23 with the timing side main shaft lengthened to accommodate the extra main bearing fitted to the M20. Consequently the timing side flywheel number was changed by one digit from the M23 number. So for the M20 the numbers were as follows. Drive side 66-649, Timing side 66-651. Corresponding numbers for the M21 were Drive side 66-636 and Timing side 66-634. For the 1940 model year cheaper cast iron flywheels were introduced for both models when supplied for the civilian market , though the Military M20 retained the steel type. Numbers for the cast iron flywheels are as follows. M20.. Drive side 66-700, Timing side 66-702. M21.. Drive side 66-705, Timing side 66-707. Throughout the period of the war M20 contracts used the steel flywheels and the small number of M21 contracts the cast iron type. For 1946 the specifications remained the same for both models, the M20 continuing to be fitted with the wartime steel flywheels as stocks were used up in production. In 1947 another change took place with the introduction of steel flywheels for the M21. These were fitted from engine number XM21-3473 onwards and the part numbers were.. Drive side 66-636, Timing side 66-634. No further changes took place until the 1949 season when cast iron flywheels were reintroduced for the M20 civilian models. It can be assumed that the steel versions were still supplied for WD model spares as and when required. (The 1951 and 1954 WD M20 standards books for the M20 still show the appropriate numbers for the steel type). At the same time cast iron flywheels were again fitted to the M21, the exception being those supplied to the Automobile Association which retained the steel type. At some point after 1949 production of flywheels was concentrated on a single pattern of steel forging that was used for four different models…The M20, M21, M33 and B33. These carried the same part number for both the drive side and timing side flywheels.. 66-635. and were machined to provide the appropriate stroke etc. for the different engines. Identification of the exact year of introduction of these standardized flywheels is not possible with the information currently available as for all models the part numbers shown in BSA parts lists remained unchanged. Ordering of spares would thus be done by model type, not part number.